Winter wildlife in and around Banff can be viewed as the cold and deep snow high up drive animals to the valley bottoms for easy viewing opportunities. Build a connection to this World Heritage Site as you visit Banff's landmarks and view wildlife in their natural winter habitat. Hear how the history of the Bow Valley changed when three railway workers rediscovered a hidden treasure. See and learn about wildlife behavior, habitat, and their winter survival adaptations. 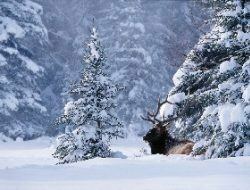 This is Banff's best tour for viewing wildlife which are seen on 95% of the tours. Combine the Lake Louise and Icefields tour in the afternoon for savings.